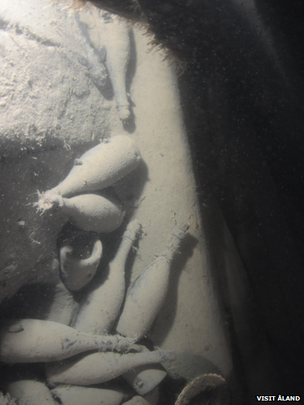 Bottles of 170-year-old shipwrecked Champagne were unusually well preserved, but contained extraordinarily high levels of sugar along and traces of arsenic, scientists have confirmed. A total of 168 bottles of Champagne were found 50m below the Baltic Sea in 2010 off the coast of the Aland archipelago in Finland. Produced by Champagne Houses including Heidsieck & Co, Ponsardin, Veuve Clicquot and Champagne Juglar, which later merged with Champagne Jacquesson, the shipwrecked bottles were estimated to be around 170 years old. Taking three Veuve Clicquot bottles, a team of scientists led by Prof Philippe Jeandet from the University of Reims in Champagne-Ardenne, have carried out a chemical analysis of the liquid, discovering very high levels of sugar and traces of arsenic. While much of the CO2 had dissipated, much of the wine’s chemical features were preserved thanks to the “close to perfect” ageing conditions of the cold and dark seabed. Such conditions had allowed the Champagne’s “intrinsic features” to be preserved, allowing the team to shed light on the winemaking practices of the 19th century. The main difference was the sugar content, which was about 150g per litre (more than most Sauternes), compared to today’s Champagnes which are generally between 6 to 10g per litre. This high sugar content was characteristic of people’s tastes at the time, with the Russian market known for its preference for sweeter wines, so much so that it was common for people to add sugar to their wine at dinner, said Jeandet.Traces of arsenic in the wines were attributed to the probable use of arsenic salts to control pests in the vineyard. The presence of wood tannins suggested the Champagne had been aged in barrels, while surprisingly high levels of lead and iron were explained by the barrels’ iron fittings and brass valves, which likely contained lead. Speaking to the BBC, Jeandet explained how he was only able to taste 0.1ml of the wine as part of his analysis. He said it was “impossible to smell” because of the tiny quantity, but that the taste remained for “two of three hours”, recounting flavours of tobacco and leather. In 2011, two of the salvaged bottles were auctioned off with one selling for €30,000 (then US$44,000) – a record for Champagne. Eleven more bottles were sold in 2012, while the remainder oif the haul is stored in Åland and may be auctioned later date. 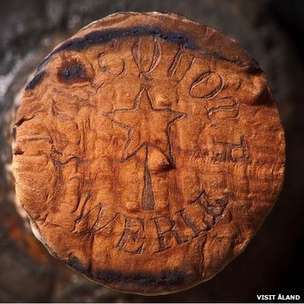 Last year Veuve Clicquot sank 300 bottles and 50 magnums of Champagne near to where the 170-year-old bottles were found as part of a 50-year ageing experiment to commemorate the find.